HALLIE EPHRON: Rhys, I fully expect a huge exodus from here to your part of the world. I live just south of Boston, the bullseye of this year's Snowmageddon. We joke that we’re changing our name to Alaskachusetts. That the penguin is replacing the chickadee as our state bird. I now understand “lake effect.” Because I gather that’s what’s happening. The jet stream is pulling down frigid air, shooting it down through the middle of the country, sweeping it back up and out over our ocean where the warm temperatures are making it snow. And snow. And snow some more. We are in a little snow vortex. No, we don't have a snowblower. This picture shows me, shoveling the last 2-footer after two previous storms dumped 3 feet and 2 feet respectively. A month into this and we're still festooned with icicles. There's still no parking on my street which has 6-foot mounds on either side of a single lane. But we're dry and warm. The people I feel for are the snow plow drivers and our poor mailman -- last SUNDAY morning at 7 AM I nipped out to get the paper (which glory be! had been delivered) to discover him coming up my walk, and catching up on mail delivery. Poor guy looked exhausted. Though we seem to have come through intact, the roof of my local UPS store collapsed. 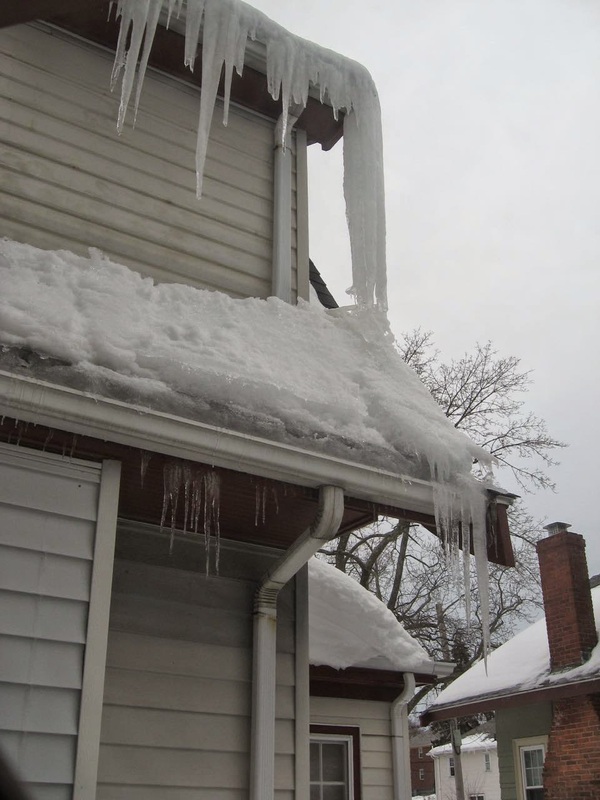 My lovely neighbors have ice dams in the back of their house and tiles popping off the bathroom walls — their insurance company sent emergency services with massive fans to dry them out. How much snow? Our clever press got excited when the 30-day total exceeded David’ Ortiz’s height (6’4”) 76.5” in 30 days.The last round of snow showers brought Boston’s totals to 101.8 inches. Here’s the view from my office. Yes, up to my eyeballs. And with it all, here’s a bunny (can you spot him? at the base of the fence post) hunkered down in our garden behind a bush. I'd seen his tracks through the snow and then, there he (she?) was! How do they survive? I gather this winter there's plenty of misery to go around. Did I mention the cold? Single digits every night. Am I ready for spring? You betcha. We're all guessing when the snow will be melted. May 1? A few weeks ago it was seriously suggested that we should consider giving up winter for lent . . . and while we've had quite a bit of snow and cold ourselves, it hasn't been as bad as what's been dumped on Boston. Living along Lake Erie's shoreline, we're well-acquainted with the lake effect. But, I can't remember ever getting dumped on like Boston this winter. It's like Buffalo, maybe. Or the U.P. Nowhere I ever wanted to be in the wintertime. To add insult to injury, our temperatures finally went up to a balmy 30-40 degrees for a few days and the snowpack here has started to melt--creating fog. Yep. The roads are free from snow until Monday's predicted snowfall, but you can't see them to drive on! I would normally be hanging laundry on the line by now. But with three feet of snow still under the clothesline, that ain't happening. Up here in the northeast corner of the state we broke the record snowfall weeks ago with 110.5 inches, 1.2 over the record. I know there are crocuses under there somewhere wishing they could bloom! Two (three?) years ago we had such a mild winter here in Maine that our snowdrops bloomed under a big spruce tree in our front yard on the last day of February. This year on February 28, three feet of the white stuff sat in that same spot. I predict my snowdrops will first bloom on April 7, and all the snow will be gone (even that last bit that hides in a shady corner of the back yard) on April 27. But then, I'm a known optimist. Would I get pelted with snowballs if I said I'm not ready for winter to end? It's only mid-March. It's not supposed to be 50 degrees here, in mid-March. April 7? you are an optimist Brenda! I hope you're right. Hallie's pix look kind of cool, but not for 3 months running. I suspect the therapists' chairs would be humming--if anyone could get out to go. Crazy, crazy, crazy. It's melting now--our barometer is our four foot high sundial, which for WEEKS was invisible, completely covered. You can now seethe top of it, hurray. 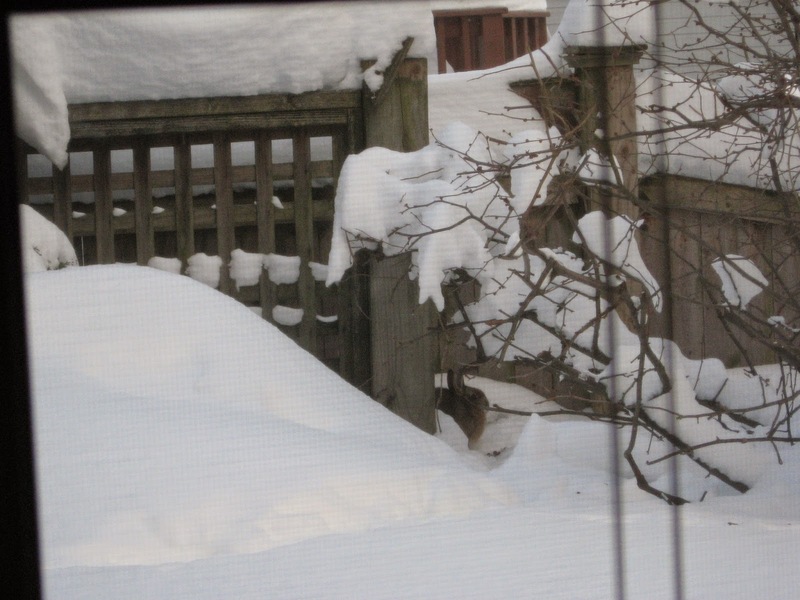 FOr more than a week, you could not open our back door--the snow was too high. Here in southern CT at the shore we've had more snow than usual this winter, but nothing like what you have in Alaskachusetts! In the past couple of days some patches of grass have begun to show at the edges of the sidewalks, and we've begun seeing robins outside our windows at work. Personally, I think they look a little shell-shocked! Poor things! I am Anonymous; hit the Publish Your comment too soon! In 2003 my middle daughter started her first year at Olin College of Engineering in Needham, MA (the second year of the college). In October there was a 3-foot snowfall, prompting her to wonder why on earth she thought New England was a good place for four years of college. Last year, my oldest daughter, who lives just north of Detroit and who LOVES snow with a passion bordering on insanity, was so fed up with the more than 100" that blanketed the area from November to April that she actually cried when more came in March. Brenda, our snowdrops usually bloom late February, but they did not pop up until this week, when the snow finally melted away over top of them. Between these pictures and the ones from my dad in Buffalo last Thanksgiving (when they got 8 feet of snow in 3 days), I'm glad to be living in Pittsburgh, where it's 40 degrees and everything is melting. Here's hoping you see the ground soon! Not even funny anymore. But I'll try: Next year, can we have the Iditarod in Boston? When we had that kind of snow last year, I took to tossing vegetable peels into the back yard (they always disappeared) for the bunny that I had seen hopping up the sidewalk looking for ANY trace of vegetation (there was none). The best $375 I ever spent was for a small Toro "Powerlite" snowthrower which uses paddles instead of an auger (I'm afraid of the big ones). It weighs only 35 lbs, has an electric starter, and isn't hardy-- pieces fall off all the time from the vibrations and have to be reattached. But it throws the heavy stuff over the piles at the side of the driveway. It is still exhausting to push that thing around, but at least when I come in from an hour of walking a mile up and down my 60 foot driveway, my back doesn't hurt. And yet we didn't get nearly enough rain to end the drought. As much as I enjoy our warm winters, we need rain, and I'm still praying we get what we need. Come to Montana -- 70s this week. But we're cyclical here - last winter was a lot of snow. Our snowfall has been so far from the dramatic amounts affecting you, Hallie, and others in the eye of the storm, but for us the foot of snow we received week before last was a major deal. I was so glad to see the snow melt and temperatures in the 50s and even up to 60 this week. I counted six squirrels in the front yard yesterday, and the birds and bunnies are hopping all over the yard, too. I looked up at the buds on our big tree out front (had to cut down our big ones in the back, so it's our last great tree), and I was so happy to know that soon the tree would be thick with leaves. And, then I think of you, Hallie, and all the people who have had to deal with the enormous amounts of snow, and I feel a bit guilty in my pleasure. To insult to injury, those with the heavy snows now have to live through the slush stage, as Hank mentioned. We're supposed to get heavy rains here tonight and tomorrow, but I can tolerate that much better now.